Welcome to the Billionaire Cab Driver Financial Planning System. This guide will help you navigate through our on-line financial planning process. The Billionaire Cab Driver Financial Planning System has been designed to provide answers to your most important long-term personal financial planning questions. How large of an investment base must I build until retirement in order to insure that I will receive the inflating income stream I will need until my projected mortality? How can I plan in advance for my children’s educational needs and reduce the cost of this expense through planning? How big of an estate would I need today, if I were to die tonight, to insure that my spouse (and family) would receive an inflating income stream until his or her death? These are the questions this process will help you answer. The following information describes how to use your on-line Billionaire Cab Driver Financial Planning System. This program is licensed for your purchaser’s use only to create your own personal financial plan. It may not be used to produce any form of financial planning reports for any other individuals other than the immediate family members of the purchaser. The use of this program to generate any financial planning reports which are later sold to third parties is strictly prohibited. The financial planning industry helps individuals achieve basic economic goals. Studies have shown that the major motivation for personal financial planning and investing is to relieve anxieties about an uncertain future. Further studies show that most clients want to accomplish three primary goals. These are: (1) planning for a safe, secure retirement, (2) providing for their children’s college educations, and (3) making provisions for survivor income needs in the case of the premature death of an income producer. Government statistics concerning retirement confirm the importance of prudent planning. They state that approximately 95% of the people in the United States will become dependent upon either their children andor Social Security. The Billionaire Cab Driver Financial Planning System has been designed to allow the user to select the financial planning problem in which he or she is most concerned and obtain a clear concise solution to the accomplishment of that goal. This information follows the same sequence as the process operates; from left to right across the top navigational bar on your screen. You must first complete the input of your personal data on the Plan tab before you can Generate a Report. When you log into your account, the site will first open on the Plan tab. The Plan tab is where you will input or change your personal information about yourself, your spouse (if applicable), and your goals. The upper left section of this page is called Client Information and is about you; the right section is called Spouse Information and is where you will input information about your spouse if you have one (please see image below). Fill in the information requested as shown in the above example, for you and, if married, your spouse. As you navigate through this section you will see terms with which you may not be totally familiar. As you do you will noticed that many of the fields are already filled in. These are just placeholders and should be replaced with your desired input. Retirement Age – Enter the age at which you wish to begin your retirement. The preset age of 65 is only a suggestion. Desired Monthly Retirement Income – Enter the amount of pre-tax income you wish to receive monthly when you retire. Do not inflate this number as the computer will calculate the effects of inflation for you. Additionally, the desired retirement income you wish to receive should be net any Social Security or any other annuity benefits you feel you may receive. Investment Rate During Retirement – Enter the annual investment yield you would expect your investments to earn after retirement begins. Therefore, you adopt a more conservative investment philosophy. 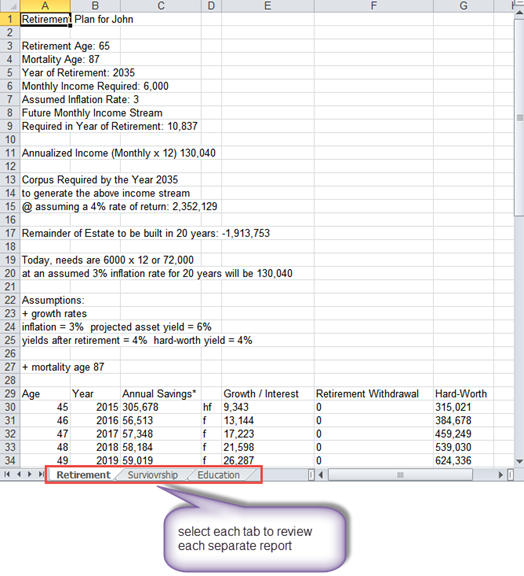 Hard Worth – Enter the amount of your Current Hard Worth (your hard worth is your net investment asset base). This is the starting asset base from which your plan will be built. For example, if your current net worth is $500,000 and your investment assets equal $250,000 of that, enter $250,000 as your Hard Worth. Include in this amount stocks, bonds, non-personal mutual funds, real estate, accounts and notes receivable, and other investments. Hard Worth Growth Rate – Enter the annual investment yield that you would expect your Hard Worth assets to grow per year from now until retirement. Hard Worth growth may be considerably lower than your normal investment yield because your Hard Worth may include assets that do not typically grow at the same rate as more aggressive investments. Inflation Rate – Enter the long-range average inflation rate you wish to project for the life of this plan. High Investment Rate – Enter the projected annual yield that you would expect to earn each year on your liquid investments. Annual Contributions to IRA/Keogh – If you, or your company are currently making a regular annual contribution to any form of retirement program (IRA, Profit Sharing, 401K, Pension, Keogh), enter the total amount of all dollars contributed annually. Growth Rate of IRA/Keogh Investments – Enter the annual yield that you would expect your IRAlKeogh/401K or other pension contribution to earn each year from now until retirement. Investment Rate for Survivorship Funds – Enter the projected annual yield you would expect your spouse to be able to earn on her assets after your death. Desired Monthly Survivorship Income (in today’s dollars) – Enter the amount of pre-tax income you wish your Spouse to receive monthly in the event of your premature death. Do not inflate this number as the computer will calculate the effects of inflation for you. Additionally, the desired monthly survivorship income you wish your Spouse to receive should be net any Social Security or any other annuity benefits available. The lower portion of the Plan tab is a section to input information about Education goals for your children (if applicable). Click Add Child for each of your children’s education goals you want projected in your plan (please see image below). This will bring up a separate data section for each child to input your desired goals (shown in the red box below). The information you can enter in this section is self-explanatory and includes a sperate break out for both college and graduate school (if desired) and their related annual costs. When you enter the year each child entered First Grade, the software will compute forward from this year forward to the year they will enter college (assuming they go through 12 years of primary education). If for some reason you child will not start college 12 years after First Grade, then you can adjust the year entered for First Grade to allow the software to correctly select the first year for their college to begin. Each time you click Save Child, it will add that child’s goals into the grid below, which shows everything desired for each child being included in your plan. The final section in the Education area is to account for any money that might have been set aside to help with your child(ren)’s educational expenses. For example, you may already have started setting aside money for your child(ren)’s education, or relatives may have created special funds to be delivered to your child at a certain date for this purpose. The Gifts section is is designed to allow you to enter. 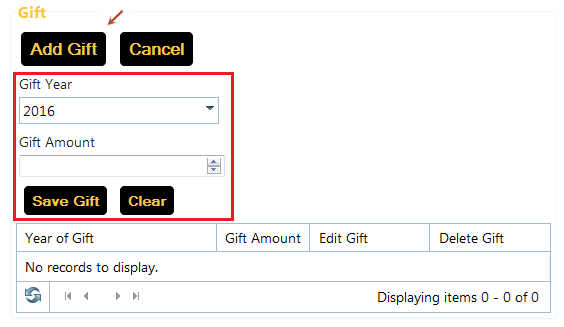 If you clik on Add Gift, it will open up two entry field for you to select the year the gift will become availble and the amount of that gift to be received (please see next image). After you have all of the information input for your Retirement, Survivorship Income Needs, and Educational goals, you are ready to generate the actuarial calculations for each segment of your plan. If you took at the top of the Plan tab you will see two options to generate these reports (please see image below). The Generate Report will have the software generate the complete set of actuarial calculations for the accomplishment of each of your goals and store those in your account. You can display each of those reports on your monitor by clicking on the heading of the desired report across the top set of navigation tabs (see red box in the preceding image). This will allow you to go back and forth to tweak you plan until you have designed one that both fits your goals and budget. After you have tweak your data to produce the plan that you feel meets both your goals and budget, it is time to create your written personal financial plan. Your written plan will explain every step of the process to accomplish this plan. It will also include all of the actuarial calculation contained in the reports you have generated and explain each to you. 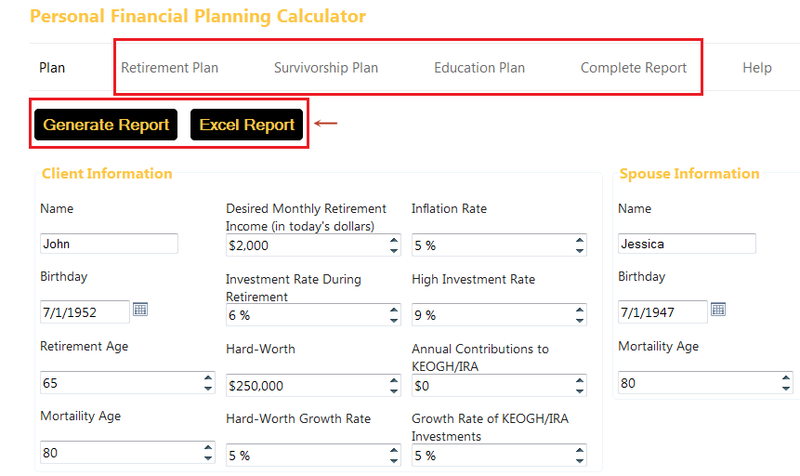 To create your written personal financial planning report click on the Complete Report tab and then on the Generate Complete Report button (please see below). Generating your complete report will take a couple of minutes to generate as it is a complex process, so please be patient. When the process is finished, you will be prompted to either save the file to your computer or display it to your monitor. Once saved to your computer you can print the report on your printer. Thank you for selecting Billionaire Cab Driver Financial Planning System and we wish you success in accomplishing all of your financial goals!